Well, we fought a good fight, but here we are. Yesterday evening we thought we had it beat, but through the night things took a turn for the worse. 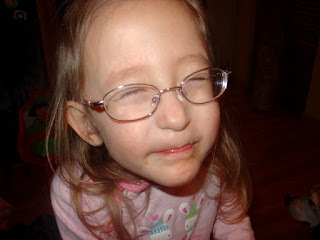 Eden's cough was out of control and she started having trouble catching her breath. 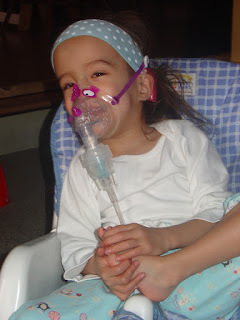 She was needing Albuterol treatments every 2-3 hours, so we had to bite the bullet and bring her in. Her lung xray today is showing some pneumonia in her right middle lobe. We don't know if it's viral or bacterial, but I'd bet the bank on viral since she's been on antibiotics for an ear infection since Tuesday. I'd venture a wild guess that the ear infection is viral too...but what do I know? As much as I hate being in the hospital, I feel a lot more relaxed since we got here. I was worrying myself silly over whether to bring her or not. I hate coming to the ER and exposing us to all of the hospital mega-germs if they are just going to send us home to do the same things I am already doing...antibiotics, steroids, breathing treatments. 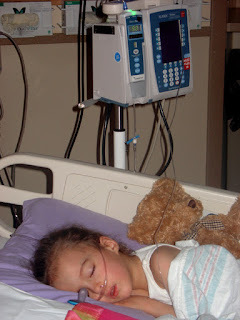 But here they have oxygen and IV fluids, and once we start needing those, it's time. So here we are. A little someone else fought the good fight and WON! Now that's a first! Prayers for your little one. Drat! Whenever I see you show up on my google reader in winter I think "oh I hope they aren't in the hospital again"
Good luck and I hope it is a short stay! I'm so sorry! I hope it's a short stay. So sorry Eden is back in hospital again - hope she will bounce back quickly. And hooray for H fighting off the germs, that's a big relief. Hang in there Billie! We're praying for some powerful healing. Ooohhh I hope Eden feels better soon! I'm glad Holland is doing ok. It's a real challenge to keep one twin healthy when the other is sick. Hoping for a short stay! Oh, I was hoping that they were both going to be able to beat it this time. Sending prayers and well wishes Eden's way. ps I know this is going to sound kooky, but Eden has a beautiful hairline! I'm so used to seeing her in headbands, I was struck by how pretty her little swirls are around her face. She's such a cutie pie! Oh no! I was sure that the girls were going to make it through this one without a hitch. And to think it's Eden this time! Sweet girl. I hope that your stay is short and that you are all home and feeling great again soon! Sorry to hear Eden is in the hospital, you did all you could at home. Hope it is a short stay. Oh no! I hope Eden gets better soon so she can home. I use to love the winters, but now I hate them since I have Tyse now. It seems like he gets sick all the time and he doesn't even go anywhere. It's amazing. The hospital that I take Tyse has been updated expect the pediatric floor and every time we are admitted I think... “Why are we stuck with the floor that brings us back to the 60’s?” Maybe, someday, I will be posting the NEW pediatric floor. I hope both your girls get better soon! Spring is coming…hopefully! Poor Eden. I'll be thinking and praying for your family, and hope that she makes a quick recovery. Maggie and Michael want to tell Eden that they hope that feels better soon!! I am SO sorry to hear that Eden is back in the hospital. We're hoping for a VERY short stay and a very complete recovery! (((((((hugs))))))))) -- hope you're outta there ASAP!!!!! Oh no! I was hoping you could avoid the hospital! I am hoping for a very speedy recovery! Hopefully this stay will be a brief one. I was checking your blog waiting for you to say Holland was in and was surprised that it was Eden this time. Last year Elizabeth had Rt. 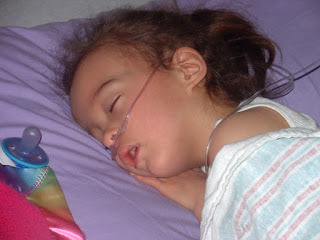 middle lobe pneumonia and they had said middle lobe was potentially aspiration and it kept her in for a week. Last week she had Rt. lower lobe pneumonia and they though it was viral with probable RSV. Whatever things are out there they really take a tole on our kids. I started using Slippery Elm that Ellies mom had suggested it helps rebuild cilia in the respiratory and GI tract and I really think it helped get her better quicker, she didn't end with that chronic cough after. I hope Eden can be home soon and you can all catch up on your sleep at home. I can't believe how much she looks like Mommy in the picture. Bummer for Eden here's hoping she gets better fast. But a big YES for Holland. Way to go girl! Why of why? Thinking of you and sending strength. Please let me know if I can do anything! A small relief nowing that you are in a great hospital. Dave said aww when he saw this post too. He is pretty sure that one family should not have all this @^$%# luck. Hugs for all of you! Oh poor baba! I am so sorry Eden is sick and on the hospital. That's hard. I hope she recovers quickly. Go Holland for fighting it off! Fevers and Vomit and Coughing...OH MY!